Hoping to attract a mermaid from her native element, this romantic gentleman has disguised himself as one of her kind. Amuse the man in your house with a bit of retro. humour. 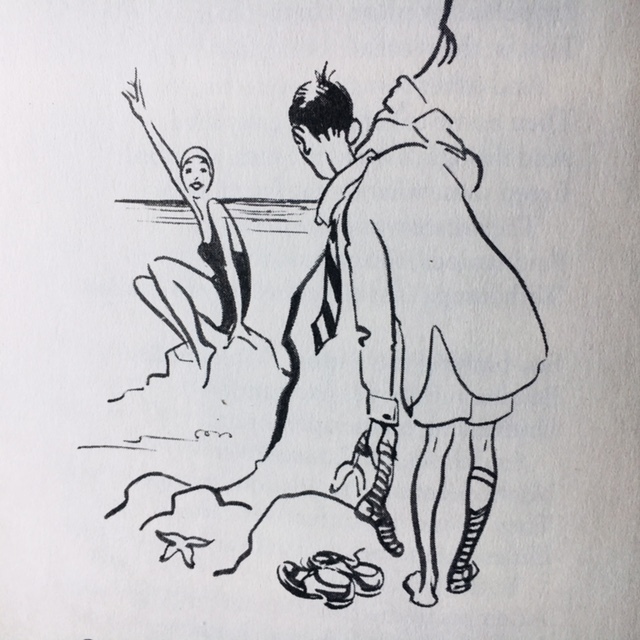 The ‘beaut’ in a one-piece bathing suit is The Siren in a shamelessly punning set of verses by Harry Graham (1874-1936), master of the ruthless rhyme. 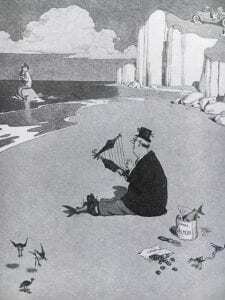 The gentleman trying to attract a mermaid at Margate springs from the fertile imagination of his contemporary Heath Robinson (1872-1944). Both Graham and Robinson will raise a chortle or a full-blooded guffaw from any unreconstructed male. Father’s Day 2018 falls on Sunday 17th June. This week only, if you order a copy of Very Heath Robinson by Adam Hart-Davis, we’ll send you a complimentary copy of When Grandmama Fell Off The Boat by Harry Graham. The first book has more than 350 illustrations by the man Philip Pullman christens the Grand High Celestial Mechanic of Absurdity. It has a whole section on the Finer Points of Courtship and Romance, including how to win back your wife’s heart on St Valentine’s Day, how to conduct secret liaisons and how to attract mermaids. The picture of the merman comes from page 69 of Very Heath Robinson. This is from page 30 of When Grandmama Fell Off The Boat by Harry Graham. Order Very Heath Robinson at £40.00 here and we’ll send you a free copy of When Grandmama Fell Off The Boat worth £9.95. Postage and packing are on us. Please order by Thursday 14th June to be sure of receiving your books in time for Father’s Day, which is on Sunday 17th June.